Using a Alpha Hydroxy Acid or Beta Hydroxy Acid are my preferred ways to exfoliate. Some scrubs can be ok but I believe that chemical exfoliation is a better way to go. I think AHAs and BHAs work more effectively and if you don't leave them on too long, are actually gentler on the skin (scrubs can possibly pull and tear). To give a quick chemical exfoliation lesson, some AHAs are glycolic acids from fruits or sugars, lactic acid from milk, and malic acid from apples. These give excellent surface exfoliation by eating away and dissolving dead skin cells. BHAs are salicylic acids and penetrate the pores to clean out dirt and oil; they are perfect for oily, congested, acneic skin. Sorry for all the boring details but knowing all this can help you choose which product is right for you. That said, there are a variety of ways to use your chemical exfoliants. In toner form they are gentle and left on the skin. In serum form they are highly concentrated and often mixed with other beneficial ingredients to form a cocktail that you leave on. And masks are a terrific way to clean things out once or twice a week. These you definitely wash off. And very important: if you are using these or any exfoliation regularly you MUST MUST MUST use sunscreeen! 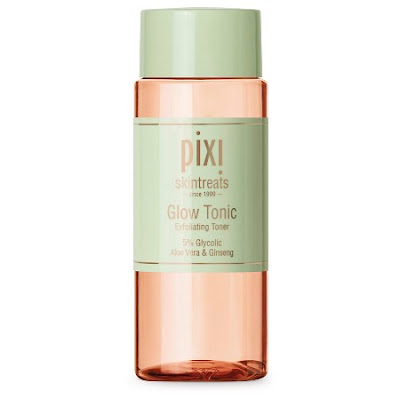 Pixi By Petra Glow Tonic has cult status. In fact my Target is always out of it so I am left to order it online which really is nbd. Its special formula includes aloe vera, botanicals, and 5% glycolic acid (a mild dose). And no alcohol! It makes your skin so smooth and soft and is a healthy step to take in your skincare regimen. I use the Tonic that comes in a bottle because it is mild and I have dry sensitive skin, but there is also a fabulous formula called Glow Peel Pads which comes in pre-soaked pads in a jar that contains 20% glycolic acid. These are great for oilier or mature skin or even normal skin to use on a daily basis and are more of a straightforward exfoliation rather than toner. 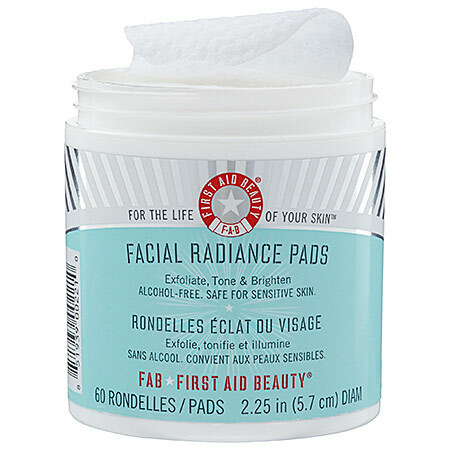 First Aid Beauty Facial Radiance Pads are as gentle as can be, but they still get the job done. They have a formula comprised of lactic acid (the least irritating form of Alpha Hydroxy Acid) and glycolic acid. There is also Indian Gooseberry for toning the skin, and aloe and cucumber for soothing. 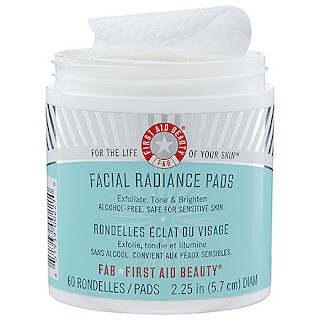 These pads aren't huge exfoliators - they are really more in the toner category but have been a reliable staple in my skincare collection for years - I always go back to them. I would say any skin type would like them. 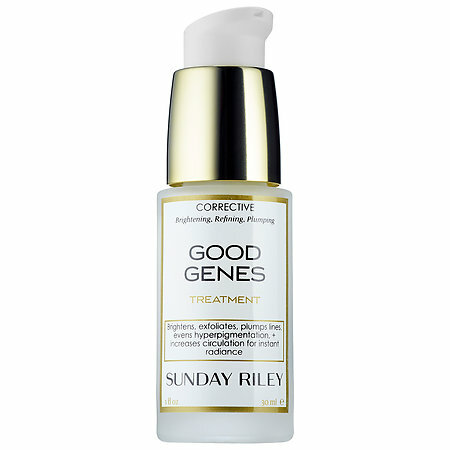 Sunday Riley Good Genes All-In-One Lactic Acid Treatment gets rave reviews. It's pricey but it'll make your skin look absolutely gorgeous. And again, because it is lactic acid most skin types can tolerate it. For my sensitive skin I only use it every other day just to be on the safe side, but boy do I love it. It has a gorgeous milky consistency that absorbs immediately into the skin to give great glow. It's a "must try"! 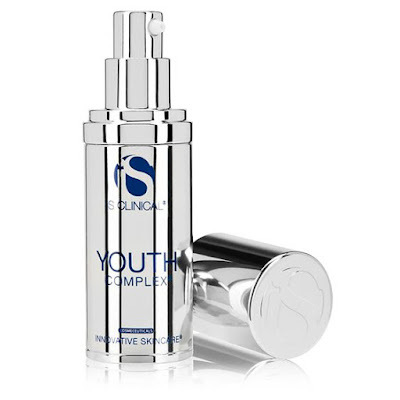 iS Clinical Youth Serum is another pricey one but well worth the cost. It is extremely anti-aging because not only does it contain fruit (glycolic) acids but also hyaluronic acid and peptides for plumping and retinol and vitamins for revitalizing. You will see immediate as well as long term results. I was introduced to this years ago when I got a facial at the spa. The esthetician there talked me into buying it and it has been a love affair ever since (with the serum, not the esthetician lol). 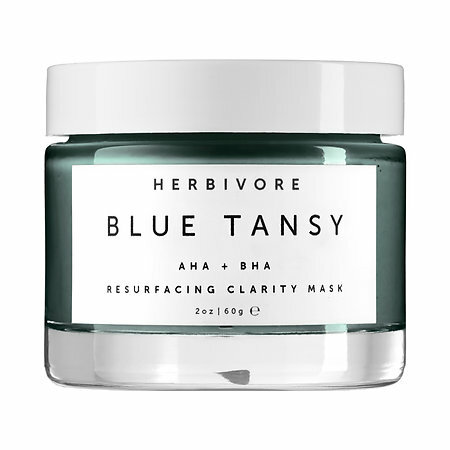 Herbivore Blue Tansy AHA + BHA Resurfacing Clarity Mask is my latest fave. It is a 100% natural awesome blue gel of fruit enzymes and salicylic acid that gives you immediately smooth skin and totally unclogs your pores. It's powerful yet not harsh on the skin, my sensitive skin didn't get red or irritated at all. I would only leave it on 5 minutes for sensitive skin but 15 - 20 if your skin can handle it. Using it once a week is usually plenty. I had first gotten it as a free sample at Sephora and I wasn't even going to try it but I did and immediately went out and bought the full jar. It is that good! 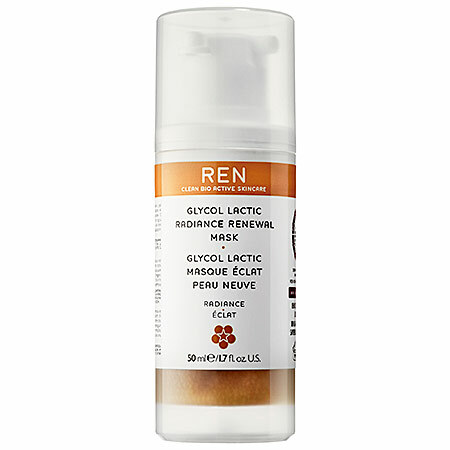 REN Glycol Lactic Radiance Renewal Mask has been around for years and is always one of the brand's best sellers. It is full of all kinds of fruit acids and some hydrating ingredients as well. The ingredients are mostly all natural. It's pretty darn strong and not recommended for sensitive skin however I use it anyway but only for 5 minutes. I love it because it really really exfoliates and sometimes that is exactly what I need. I'm sure all the sales associates at Sephora will back me up on recommending this. Also using it once a week is often enough.